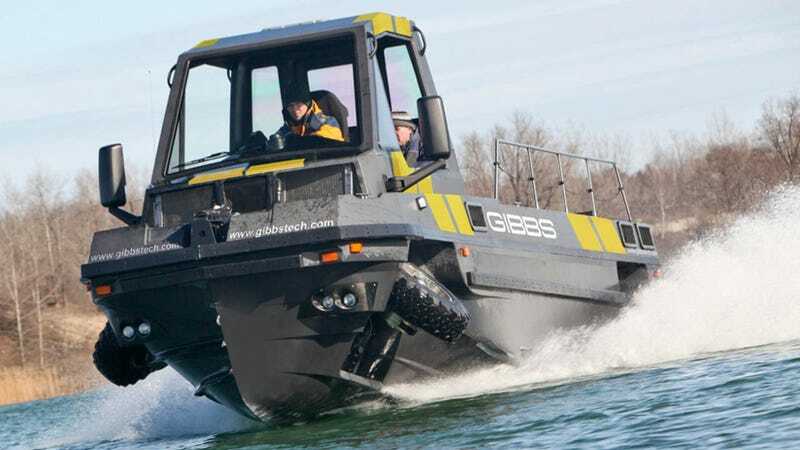 The amphibious vehicle company Gibbs Technologies is back at it, unveiling a monstrous V8-powered truck/boat called the Phibian, aimed at law enforcement and military agencies. It could just be the ultimate offroader. The specs on this thing are insane. Thanks to carbon fiber construction, it weighs over a thousand pounds less than a new Suburban, and it comes with a twin-turbo V8 diesel engine quoted at 500 horsepower. That means that this thing can cruise at highway speeds (in very open-topped comfort) and also hit 30 MPH on the water. Gibbs says the switch between land and water modes takes less than 10 seconds. Appealing to the government sector is probably a wise move for Gibbs, who have been working for nearly four years to get federal approval of their record-setting amphibious sports car, the Aquada. Maybe padding some key voting districts with giant patrol truck/boats will speed up a legislative hearing or two.